Phase 1 of the Hunter’s View redevelopment takes advantage of picturesque views of the San Francisco Bay. Image courtesy of Bruce Damonte│The John Stewart Company. Preserving affordable housing in San Francisco has always been a concern, but the issue has gained significance as rising housing prices have made the San Francisco metropolitan area one of the nation’s most expensive places to live. Based on data from the 2010–2012 American Community Survey, the area ranked second in median value of owner-occupied units and seventh in median gross rent among U.S. metropolitan areas. However, even as San Francisco’s need for affordable housing has increased, the city has neglected to maintain several of its public housing sites to the point that many units have become dangerous or uninhabitable. HOPE SF, the city’s effort to improve quality of life for residents of deteriorating public housing, is addressing the housing affordability crisis by revitalizing these public housing units. The Hunters View redevelopment, HOPE SF’s first project, is replacing distressed public housing units as well as providing additional low-income units. 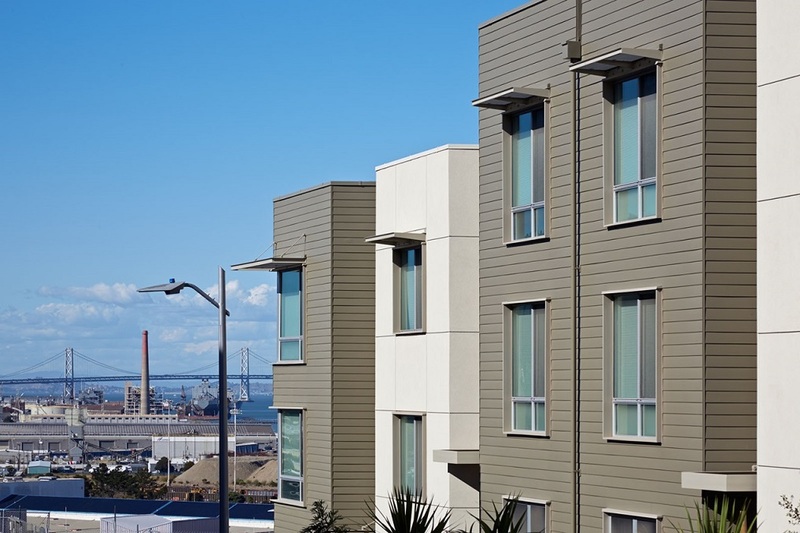 When all phases of development are complete, Hunters View will also offer new market-rate units, helping to bring wealth and economic diversity to one of San Francisco’s most distressed and isolated communities. Poor living conditions at Hunters View were among the issues that prompted the creation of HOPE SF. The units at Hunters View were constructed in 1957 as temporary workforce housing for employees at the nearby Hunters Point Navy Shipyard and were later converted to public housing. Inadequate maintenance only compounded the problems in the poorly constructed dwelling units. After 2002, the complex’s HUD physical inspection score began to decline, eventually dipping below 30 out of 100. With units classified as severely distressed, Hunters View had a vacancy rate of more than 40 percent. In addition to the poor condition of the units, Hunters View was physically isolated, with only one road providing access to the community. Recognizing the need for redevelopment, the San Francisco Housing Authority (SFHA) issued a request for proposals in 2003 to revitalize Hunters View. In 2005, SFHA selected The John Stewart Company, Devine & Gong, and the Ridge Point Non-Profit Housing Corporation to redevelop the property. At around the same time, several studies recognized that other San Francisco neighborhoods also needed redevelopment and that insufficient federal funding existed to transform these communities. An independent assessment released in 2005 estimated the cost of repairs and renovations for public housing in San Francisco at $267 million, an amount far greater than the federal government’s annual allocation to SFHA. In 2006, SFHA reported that more than 50 percent of the agency’s needed physical repairs were concentrated in Hunters View and 7 other public housing sites, where a large number of San Francisco’s families receiving services through the city mental health system, child welfare system, or juvenile probation department lived. In response, the mayor and board of supervisors committed $95 million to the entire HOPE SF initiative to provide one-for-one replacement of public housing units and to transform the 8 sites into thriving mixed-income communities. HOPE SF is intended to provide the communities with more green space, an environment conducive to private investment, and access to quality education, transportation, and employment opportunities. Although initially the effort to improve Hunters View began as a straightforward redevelopment project, SFHA decided to make the development a pilot for the more ambitious HOPE SF program. One of HOPE SF’s guiding principles is to ensure that no public housing is lost and to mitigate the displacement of residents. The Hunters View plan involves replacing all of the 20-acre site’s public housing units and increasing the total number of housing units to 740. To minimize displacement during this redevelopment, Hunters View is being revitalized in three phases. In keeping with the environmental goals of HOPE SF, the development has been certified as a LEED for Neighborhood Development (LEED-ND) community, and the developers plan to apply for certification as an Enterprise Green Community, as well as to obtain GreenPoint Rated status from Build It Green. The redeveloped street network in Phase 1 more closely resembles the street grid throughout the rest of San Francisco. Image courtesy of Bruce Damonte│The John Stewart Company. Building community, engaging residents, and offering employment opportunities for residents through the rebuilding process are among the core principles of HOPE SF. The developers of Hunters View held several meetings to hear residents’ ideas during the development process. To provide training and help improve employment prospects in the community, residents of Hunters View and the surrounding areas were hired for construction jobs. The developers also retained an onsite service coordinator to connect residents with other job opportunities. Phase 1 of the project began in 2010 with the demolition of 113 obsolete public housing units and the construction of 80 replacement public housing units, as well as an additional 27 privately managed, subsidized housing units for households earning up to 50 percent of the area median income (AMI). 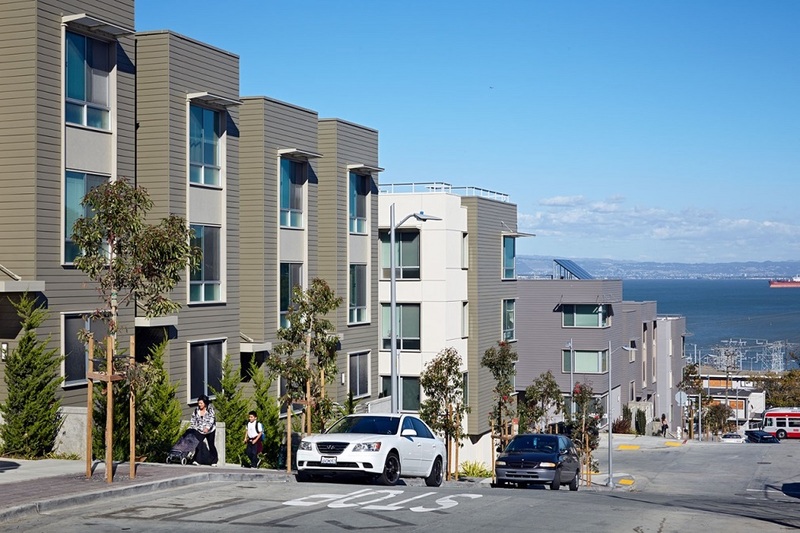 In addition to the new and replacement units ranging from 1 to 5 bedrooms in multifamily buildings and townhomes, Phase 1 features a new connected street network that more closely resembles the street grid found in the rest of San Francisco. The mayor’s Office of Housing and SFHA contributed nearly $32 million for housing and infrastructure development in Phase 1. The remainder of the nearly $80 million project was financed by the California Department of Housing and Community Development’s Multifamily Housing and Infill Infrastructure Grant programs, the now-defunct San Francisco Redevelopment Agency, federal low-income housing tax credit equity, conventional debt, and grants from philanthropic organizations. Fully leased and occupied by the summer of 2013, Phase 1 became home to 67 returning households. According to Margaret Miller, vice president of development at The John Stewart Company, market constraints prevented the market-rate units from being developed concurrently with affordable units in Phase 1. The latest strategy for providing market-rate housing includes selling lots in the Hunters View complex to third parties to develop up to 390 housing units. The majority of those units are anticipated to be market-rate housing, with 10 to 15 percent of the units set aside for low-income buyers. Construction began on Phase 2 in late 2013. When completed, both Phase 2 and Phase 3 will contain an additional 187 public housing and 56 low-income rental units, as well as a yet-to-be-determined number of market-rate units. In addition, the last two phases of the redevelopment will continue reconnecting the street grid, thereby reducing the community’s isolation and providing better access to public transportation. Also planned for Hunters View are a childcare center, a computer learning facility, and public parks. The redevelopment may also eventually include space for retail that will serve neighborhood residents. The HOPE SF revitalization efforts underway at Hunters View promise to help the community become more economically diverse and better connected to surrounding communities without displacing current residents. Revitalization efforts under HOPE SF have begun in several of the other seven distressed public housing communities in San Francisco. Challenges, opportunities, and lessons learned from the Hunters View redevelopment will inform and enhance these projects.